There are several kind of cover bands circulating; those that try to exactly copy the band they’re imitating, even trying to become a look-alike of them. Bands who don’t bother with the outer appearance, but who try to copy the music exactly and bands who give their own interpretation of the songs they’re copying. The latter usually being professional musicians who like to set their teeth into some other material, often as a tribute (as for instance Dream Theater have done several times). Genesis Project is actually a mix of the last 2 categories. This Dutch band consists of musicians that are also very active in other bands. The whole band, except guitar player Mark Voorbergen, also forms the cover band Knight of the Progs. 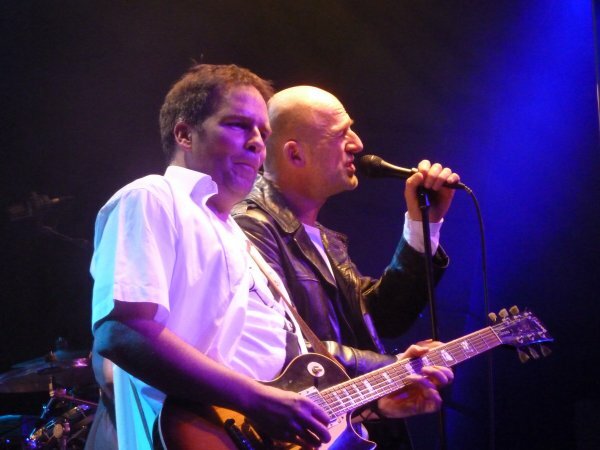 Singer Roland van der Horst and drummer Remco Engels also play in Mangrove and Roland is/was also a member of the cover bands Lakeside and Backsound whereas Remco used to play in another Genesis cover band called ‘Squonk’. 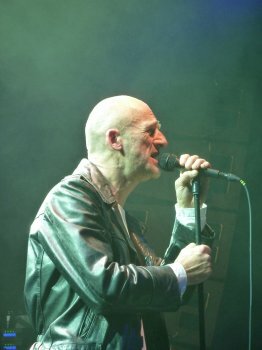 Keyboard player Ebert Zwart was also active in cover band ‘Pink Project’ and bass player Sven de Haan was one of the founding members of Salmon. Genesis Project was formed in 1999 with the goal to integral perform the whole album The Lamb Lies Down On Broadway. So they did then and now they’re back with the same concept. Although I belong to that (limited?) group of Genesis fans that thinks that The Lamb is absolutely not Genesis’ piece de resistance, I still can fully enjoy any evening of Genesis music even when this album fills the evening. But naturally as it is with any cover band the comparison with the original always lies just around the corner. And making that comparison it’s pretty easy to divide the boys from the men, or better said the wannabes and brave copy-cats from the true musicians. Without any doubt Genesis Project falls into the last category. There were certainly several moments one could have closed his/her eyes, wander off mentally several decades and feel the experience as if one is attending a true Genesis concert. With some original and creative projections on the back wall and colourful lighting Genesis Project added another element to the whole experience, but singer Roland didn’t feel tempted to do some dressing up (until the encore) although he did wear a black leather jacket just as Peter did depicting Rael, but no black make-up. The rest of the band adapted the Mangrove dress-code: all white. Judging musically I must say I spotted several mistakes and musical mishaps and even a false start with Cuckoo Cocoon. But this is a risk every cover group has to accept when playing music from a famous band that the audience already knows every bit by bit. The lack of a true Mellotron or vintage Moog synth can’t be replaced or overheard by anyone familiar with the original material and it is exactly at those moments you feel you’re missing something and gain some further respect for the ingenuity of Tony Banks. But mostly the audience easily forgives such lacks and errors as they haven’t come to hear a band exactly replicate ‘the great example’ (usually bands that don’t perform themselves anymore), but more a band that brings over the same musical atmosphere that the original offered. And that was exactly what Genesis Project did; they found their way into the musical hearts of the audience by doing their own thing with the fabulous music of Genesis taking all their own limitations into respect. This most clearly displayed itself when they played The Waiting Room, a ‘song’ that hardly can be copied consisting of a cacophony of many (undefined) sounds. Genesis Project developed and played their totally own version of this song with just keeping its initial concept into thought. 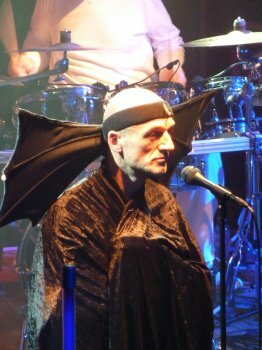 At the first encore, Watcher Of The Skies, Roland showed up in a batwing, a replica of the costume Peter Gabriel had worn on stage. The Return Of The Giant Hogweed was a powerful and fitting end for this excellent show. It truly was a display of a well-crafted and passionate way to play this old classic album live in its enterity. 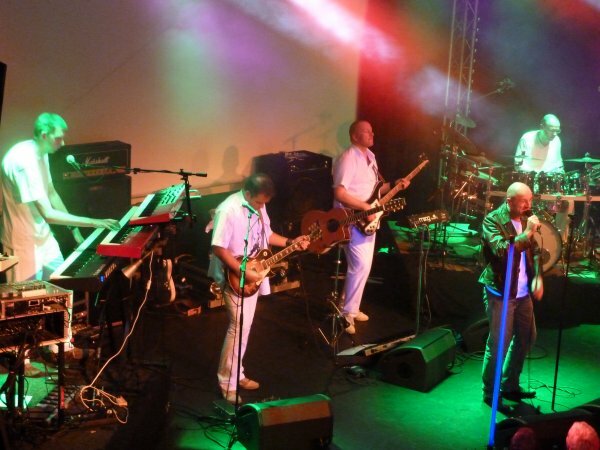 All-in all it was a great night at De Boerderij that was almost packed to the max and a true tribute to the spectacular music of Genesis.